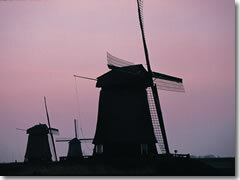 Whether for working the pumps to drain the swampy lowlands via tidy canals, or simply grinding grain into flour, molen (windmills) helped raise the Netherlands from the sea, create its fertile fields, and feed it growing population, and as such are as beloved by the Dutch as they are by camera-clicking tourists. As the Dutch have made way for progress, they have also made sure to set aside space for preservation—especially of those most Dutch of Dutch sights: the windmills. Zaanse Schans.As the countryside north of Amsterdam became industrialized over the first half of the 20th century, people realized that an entire way of life and mode of architecture was disappearing rapidly. In the late 1950s, dozens of local farms, houses, and windmills dating from the Netherlands' 17th-century heyday were broken down, carted off, and reassembled into a kind of archetypal "traditional" village called Zaanse Schans (tel. 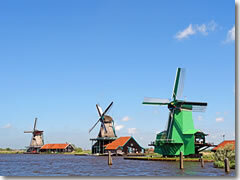 +31-(0)75-681-0000; www.zaanseschans.nl). Although Zaanse Schans is a little touristy, it's not just a sightseeing attraction—people actually live in most of the cottages and houses, doing their daily tasks in as much an early 18th-century way as possible. Unlike at most living history museums, they don't go home at night to the 21st century. Zaanse Schans molen.The grocery stores and the like truly are out of a different era, and many of the buildings have been set up as exhibits for the public, including five working windmills, five museums, and five craft shops. Short cruises on the river Zaan are also popular. Just about every sight in the village keeps different open hours, but in general: most of the visitable bits are open Tuesday to Sunday from 10am to 5pm. Some things are open Mondays as well; some things open as early as 8am (others don't open until 1pm. Summer hours are longer than winter hours. More is open on the weekends than on the weekdays. For specifics, see www.zaanseschans.nl. Note that there are about a dozen working mills on the Zaanstreek—not just the ones within Zaanse Schans park—all covered at the site www.zaanschemolen.nl. The Zaandam tourist office (Jan Sijbrandssteeg 12, tel. +31-(0)20-201-8800, www.vvvzaanstreek.nl) has information on the village; there's also a local tourism info point in Zaanse Schans itself (Schansend 1). Grab Bus 91 (twice an hour; 43 min. 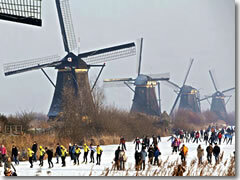 ; get off at St. Michael college next to Zaanse Schans). Kinderdijk windmills.If the handful of windmills in Zaanse Schans aren't enough for you, head 66 miles south of Amsterdam to the Kinderdijk region (it's just below Rotterdam). Before it was a Harry Chapin lyric or a children's string game, the Cat and the Cradle was the Dutch folk tale that gave Kinderdijk its name. Legend holds that, in the aftermath of the brutal 1421 St. Elizabeth's flood that inundated much of Holland, a wooden cradle was seen bobbing along in the waters of the canals flanking this high dike. A cat perched on top, apparently trying to balance her odd craft. When the cradle was fished out, a baby girl was found nestled under blankets inside—the cat had desperately been trying to keep the waters from lapping inside. The cat was hailed a hero, the baby raised by a local family, and ever after this place was called "Child's Dike. 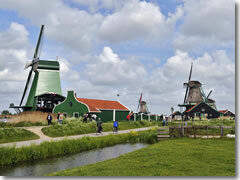 "There is a visitor's windmill (tel. +31-(0)65-208-3486), open to the public April through October, daily 9:30am to 5:30pm; in winter only on the weekends 11am to 4pm. Adm. 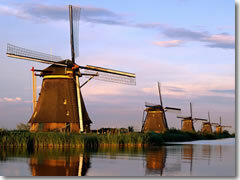 The two most useful websites for Kinderdijk are www.kinderdijk.com and www.kinderdijk.org. To get there, take the train from Amsterdam's Centraal Station to Rotterdam, then the metro to Zuidplein, then bus 154 toward Utrecht (ask the driver to let you off at Kinderdijk). Sounds complicated, but it only takes about an hour total. Get the pass: There are several kinds of tickets available to visit Zaanse Schans, each covering varying amounts of the park (or you can get a general admisison and then purchase seperate ones to some of the sights). However, do note that, if you have the I Amsterdam Card City Pass, it is valid at several museums within Zaansse Schans (including the windmills and the bakery museum), as well as getting you into most major attractions in Amsterdam (plus unlimited rides on all public transportation, a canal cruise, and more).